When we talk about food security, we’re not only concerned with the size of the pie, but also the composition of the pie—whether diets are diverse enough to provide the micronutrients one needs for a healthy and productive life. Diets in Bangladesh are not diverse, according to data from the Bangladesh Integrated Household Survey (BIHS), conducted in 2011-2012. 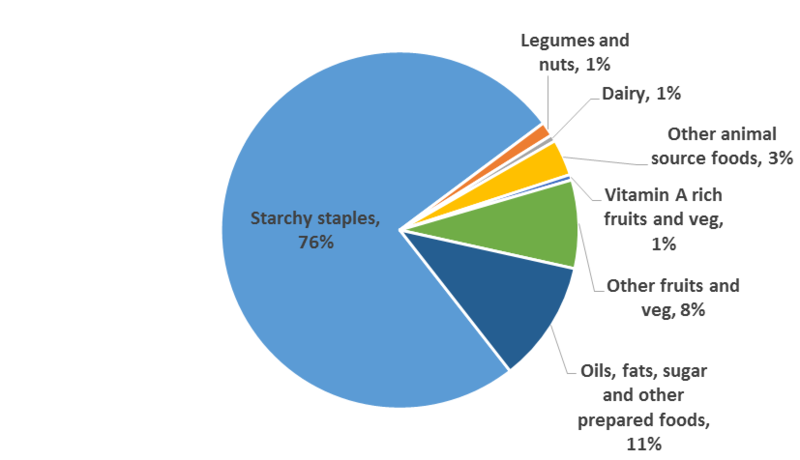 The slices of the total energy intake pie are highly unequal -three-fourths of calorie intake by a household comes from starchy staples, which provide energy but are low in micronutrients. Fruits and vegetables make up less than 10 percent of calorie consumption, of which Vitamin A rich fruits and vegetables only make up 1 percent. Dairy and animal source foods, which are considered high in micronutrients such as iron, contribute to only 4 percent of calorie intake. What can be done to increase dietary quality while assuring total energy intakes of the household? To answer this question, we looked at various correlates of dietary diversity and per capita calorie availability. We also looked at the role that women’s empowerment might play in increasing per capita household calorie availability and dietary diversity. What we found was surprising: women’s empowerment plays an important part not only in increasing per capita calorie availability (increasing the size of the pie) but also increasing the dietary quality of the pie (making sure slices of the pie are more balanced across different food groups). We did this by looking at the Women’s Empowerment in Agriculture Index, which we computed using data from the BIHS. Decisions about agricultural Production: Sole or joint decision-making power over food or cash-crop farming, livestock, and fisheries, as well as autonomy in agricultural production. Access to and decision-making power over productive Resources: Ownership of, access to, and decision-making power over productive resources such as land, livestock, agricultural equipment, consumer durables, and credit. Control over use of Income: Sole or joint control over income and expenditures. Leadership in the community: Membership in economic or social groups and being comfortable speaking in public. Time allocation: Allocation of time to productive and domestic tasks, satisfaction with the time available for leisure activities. 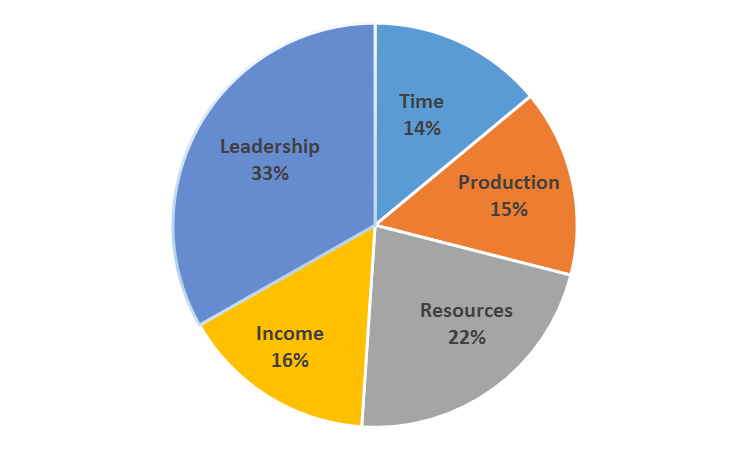 The second pie chart reveals the major contributors of women’s disempowerment in Bangladesh were the leadership and resources domains. Esha Sraboni and co-authors use this data to study the links between women’s empowerment and food security. They find that female empowerment is positively correlated with per capita calorie availability and that household dietary diversity increases if the woman decision-maker is more empowered. Their analysis highlights the importance of group membership and participation and increasing women’s control of assets as they find a strong relationship between these two measurements of empowerment and food security. There is work being done to establish validated indicators on both fronts – on the dietary diversity side a new indicator (Minimum Dietary Diversity Indicator for Women) is being developed which will allow dietary diversity of different populations to be compared and allow researchers and policymakers to identify populations who are at risk. On the empowerment side, research is being conducted to develop validated project-level indicators of women’s empowerment that can be used to diagnose key areas of women’s empowerment to allow project implementers and policymakers to design strategies to address empowerment gaps—to make sure that everyone has a fair share of the pie. Sraboni, E., Quisumbing, A R., Ahmed, A. U., 2013. The Women’s Empowerment in Agriculture Index (WEAI): Results from the 2011-2012 Bangladesh Integrated Household Survey. Washington, D.C.: International Food Policy Research Institute (IFPRI). Ahmed, A. U. et al., 2013. The status of food security in the Feed the Future Zone and other regions of Bangladesh: Results from the 2011–2012 Bangladesh Integrated Household Survey. International Food Policy Research Institute (IFPRI). Sraboni, E., Malapit, H. J., Quisumbing, A. R., & Ahmed, A. U. 2014. Women’s empowerment in agriculture: What role for food security in Bangladesh? World Development, 61, 11-52.